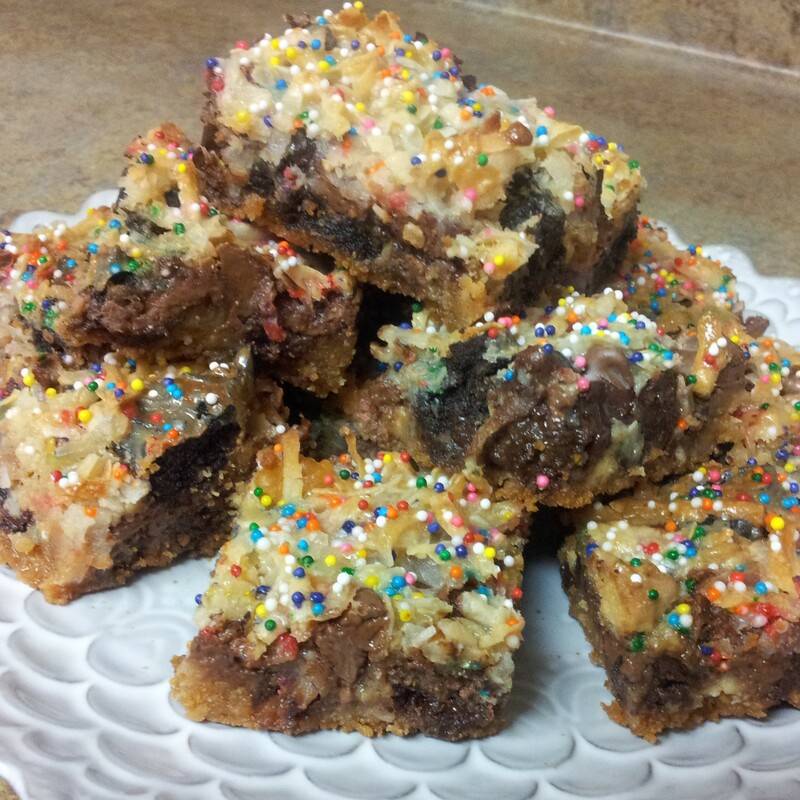 Next: Baileys Espresso Brownies with Black & White Oreos! Previous: Baileys Chocolate Chip Cookies! 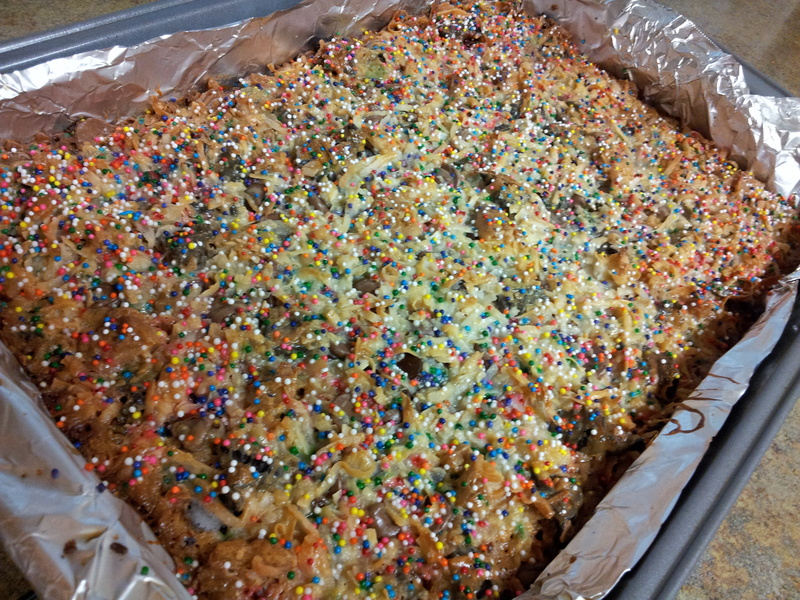 7 Layer Bars: Birthday Edition! 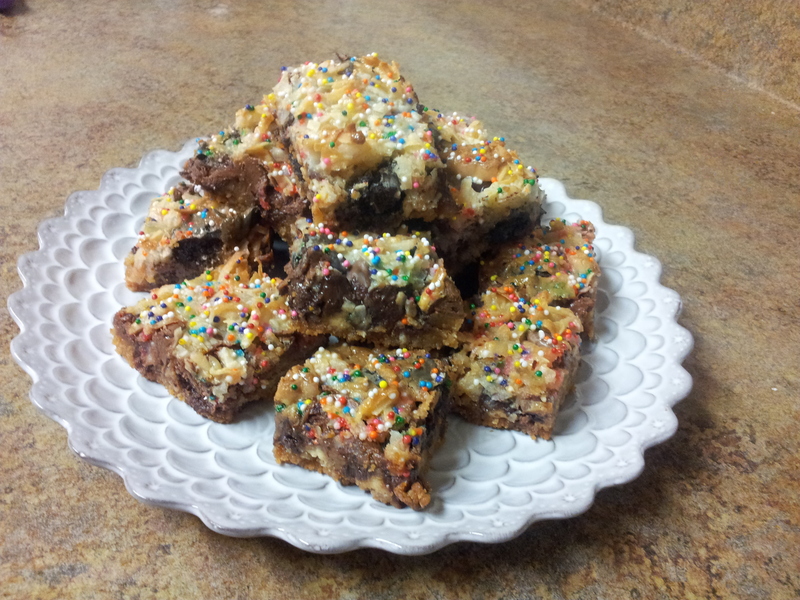 = Birthday 7 layer bars!! 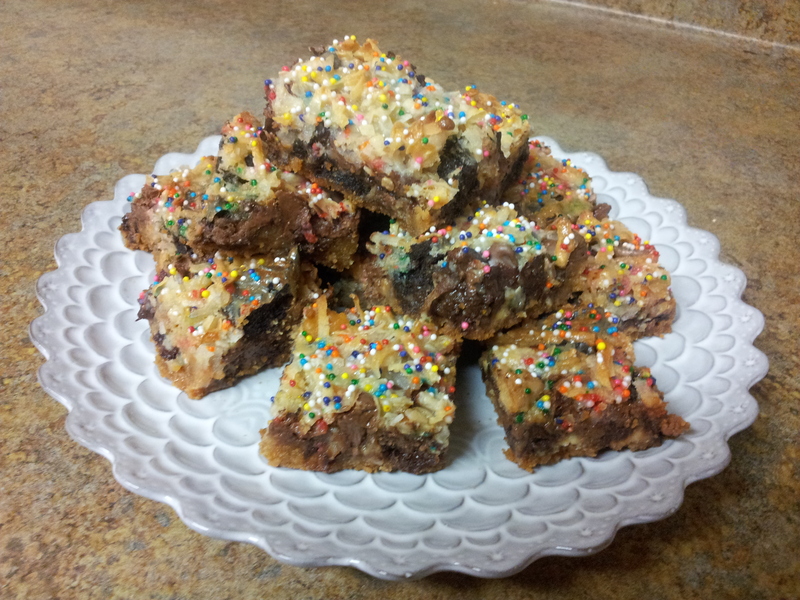 They’re gooey, they’re tasty, and they’re easy to make! First, set your oven to 350 degrees F. Line a 13 x 9 inch pan with foil. Spray the foil with cooking spray. Set that aside while you make the crust. Melt 1 stick of unsalted butter. Then, in a food processor, pulverize 1 sleeve of graham crackers (it’ll make about 1 1/2 cups of crumbs). Pour the butter into the food processor and pulse until the butter is even distributed throughout. Dumb the crumb-butter mixture into the 19 x 9 inch pan and press the crumbs out evenly onto the bottom of the pan using a wooden spoon or a spatula. Now, time to add the fun stuff! Really you can throw in whatever you want that you think would taste good! First I used about 1 cup dark chocolate chips. Then I sprinkled probably about 1 1/2 cups-worth of golden Oreos and regular Oreos (full disclosure, I used Giant brand, so not technically oreos). 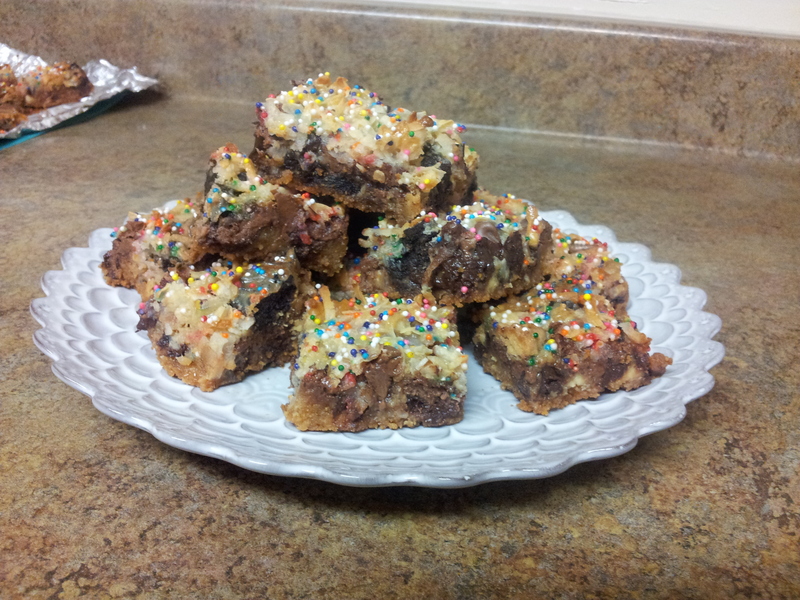 Then sprinkled on the white chocolate chips and the M&Ms. Top all of that with 1 – 1 1/2 cups coconut. Finally, drizzle the sweetened condensed milk over the whole thing. 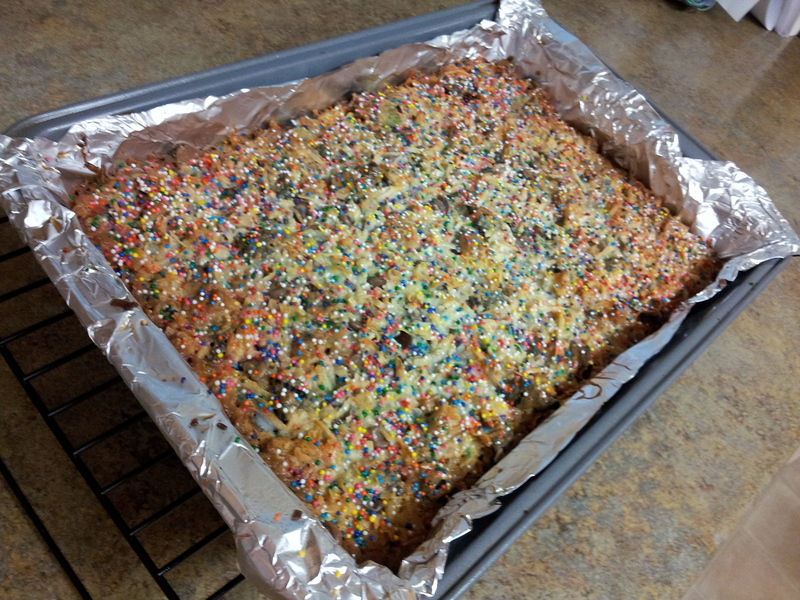 You’ll end up being able to cover the whole top with the sweetened condensed milk. Then I sprinkled on the sprinkles! Bake the whole thing in the oven for about 30 minutes (start checking after 25 minutes). The top will be a light golden brown in spots. The recipe is pretty forgiving, hence my guesstimates on quantities/amounts of ingredients. The one thing to always use is the sweetened condensed milk, and I’d recommend always using coconut.  Other ingredients to try: peanut butter cups, any type of M&M, caramel bits, toffee, butterfinger pieces, honey roasted peanuts, walnuts, chocolate covered almonds, chocolate covered espresso beans…. I made these for one of my friend’s birthdays. She lives in Texas, so I needed a treat that would travel well. This is a great option for that! What combinations are y’all going to try? !